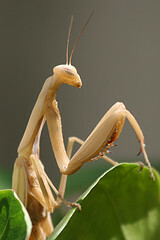 Discovered that we have a white Praying Mantis living in the large flowerpot outside our window. I've never seen one this color before. This website isn't up to full strength yet. Much of it is under construction. I'll post an announcement after additional features come online. In the meantime, I intend to write blog entries as time allows, so please bookmark blog.tjsullivanla.com and check back. If you'd like to pass on a compliment, comment and/or criticism, please do so in that order. Thanks to LA Observed for the mention. I was driving down Century Blvd. 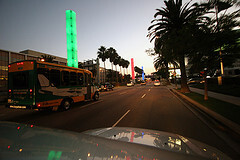 to Sepulveda last night, and noticed that many of the 100-foot-high, lighted pylons at LAX were lit up. I remember when they switched them off in January 2006 for a $1.8 million tune-up. 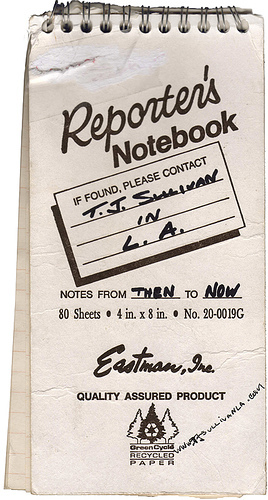 LA Observed had the story in full. The colors I saw last night were constant, so maybe LAX is just testing them, or maybe they've been on all summer and I've only just noticed. We're talking a Crayola five-pack in terms of the color selection and no transitions. Many of the pylons weren't on. I found no recent info about it on the LAX website.